What if there were a rule that allowed NCAA tournament teams a onetime chance to steal a player from a team it beat? It’s an amazing idea, like make-it-take-it, but in this case you’re taking the defeated team’s player. Sunday afternoon was the first time in a while I wanted those awful Buffalo Wild Wings commercials to be real. Whatever it took for Wichita State and Kentucky to play the game until the end of time, I was in. It was the same feeling I had at the end of Game 7 of last year’s NBA Finals; I lamented that one of those teams had to lose. What if we didn’t have to lose Early for the rest of the tournament? What if there were a rule that allowed teams a onetime chance to steal a player from a team it beat? • You can only steal ONE guy the entire tournament. I did this for a couple of reasons. If teams added a player every round, it wouldn’t even be the same team by the end of the tournament. That ruins the fun. The idea is to add one guy into the mix. This also brings real strategy into play. Say you’re LSU in 2006. You beat Duke in the Sweet 16, and J.J. Redick is yours if you want him. Waiting in the next round, though, is LaMarcus Aldridge. Picking your spot is key. • The decision to steal a guy has to be made before both teams leave the court. Imagine Nolan Richardson sitting there after beating North Carolina in the ’95 Final Four and having to choose between Sheed and Jerry Stackhouse. • I limited the options to tournaments from my lifetime, so pretty much the past 25 years. It’s not fun if you can’t actually think about what the team would look like. See! This is fun! Iverson had an awful game in the Elite Eight against John Calipari’s team, but seriously, the idea of even one more AI game at Georgetown (and with Marcus Camby) makes this worth it. 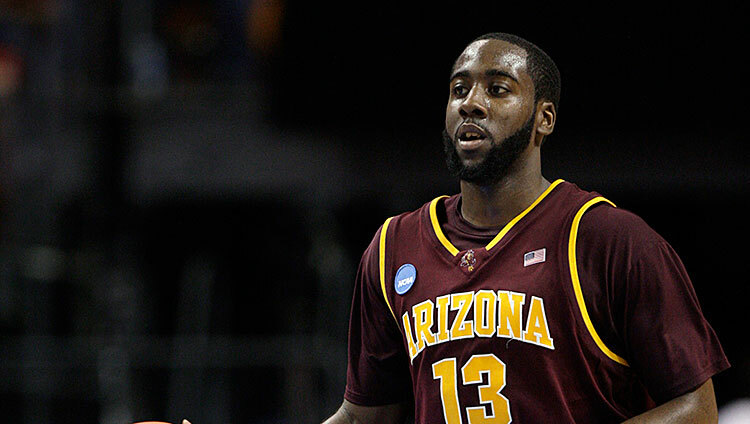 Camby had 25 in the Final Four against Kentucky, but it still wasn’t enough. That team with Iverson wins the title by double digits. There are a few different levels to this one. First, it’s an excuse to remember one of the craziest, most heartbreaking tournament moments ever. Down four with four seconds left, Williams corralled a long rebound, nailed a 3, and got the foul. Just look at Mike Davis’s reaction. It’s amazing. We all know what happened next. Williams missed the free throw, and Indiana went to the national championship game. Williams on that Indiana team isn’t all that intriguing, but he was good enough that year that I’d want to see him play with anyone. The best part, though, is what it would have meant for the national championship game: We would have gotten Jay Williams vs. Juan Dixon II. Those 18 months of Duke-Maryland games were incredible. Williams needed 10 points in 55 seconds to beat Maryland, in College Park, in 2001. Then the Terps beat Duke at Cameron, before Duke got the ultimate revenge by beating Maryland in the Final Four. 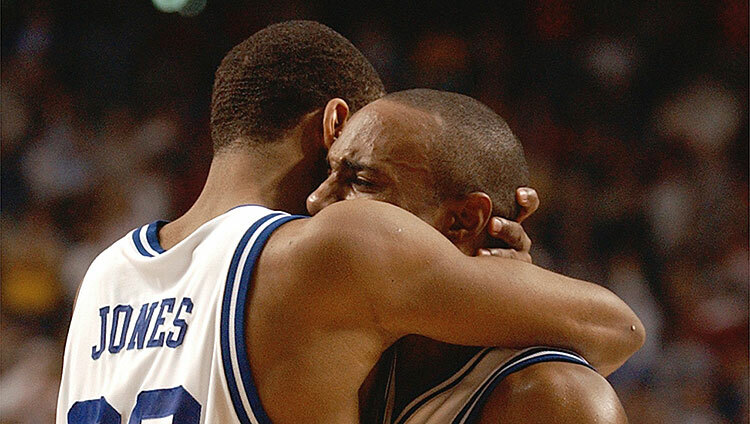 I’m all for any scenario where Williams and Juan Dixon would have played each other again. When I saw Daniel’s tweet, this is the first one I thought of. I was a freshman the same year Durant was, and watching him play on TV at a campus bar is probably my favorite memory of that opening weekend. And I still haven’t forgiven Rick Barnes for depriving us of Tournament Edition Durant after only two games. Durant was great all year, but he followed up his 27 points in the first round with a cool 30 against USC. We all deserved more Kevin Durant that year, but this is one of those situations where picturing him switching teams is almost as much about the rest of the guys he’d be playing with. Nick Young’s 22 in that win over Texas were probably even more impressive than Durant’s 30. A team with Young, Durant, and Taj Gibson is one I’d watch, especially considering they played Carolina in the next round. Swaggy P, the Reaper, and the soon-to-be Sixth Man of the Year playing that Ty Lawson, Hansbrough, Danny Green North Carolina team is almost too much to think about. This was easily my favorite, and it wasn’t remotely close. Billups averaged 19 a game for Colorado that year. The Buffaloes ended up as a 9-seed and hammered Indiana in the first round before getting trounced by UNC. Put Billups on that team and you get a lineup that includes him, Ed Cota, Vince Carter, and Antawn Jamison. Let that sink in. Carolina lost to Arizona in the Final Four that year, but I’m going to say that with Billups, that probably doesn’t happen. 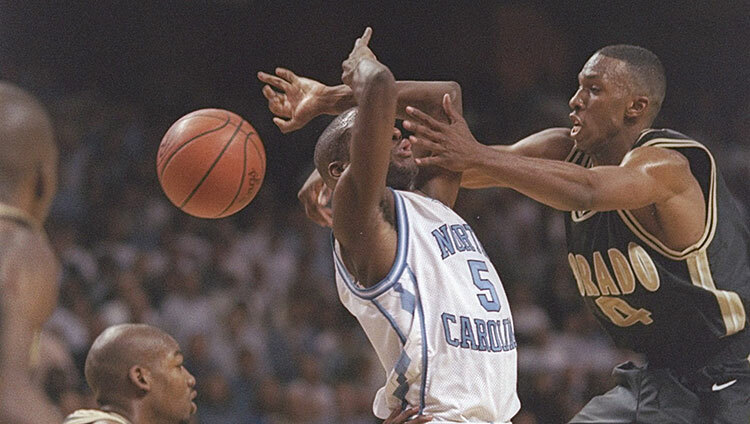 That also means that Carolina team would have faced Kentucky and its five first-round picks in the national title and Billups would have faced the coach who traded him less than a year later. OK, see, now the butterfly-effect stuff is starting. That’s too deep a hole. Anyway, we should try to make this happen. Let’s start a letter-writing campaign, or something. Also, leave your favorite ones down in the comments. I’m sure there are plenty I missed.